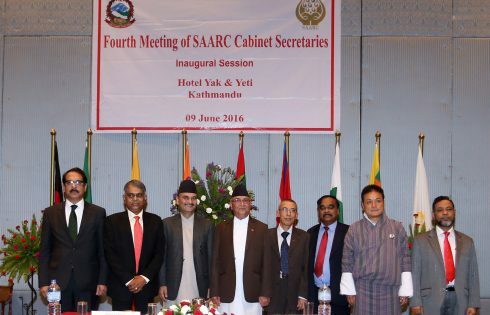 Kathmandu, June 9: A two-day meeting of the SAARC cabinet secretaries has kicked off in the capital today. While inaugurating the meeting, Prime Minister KP Sharma Oli stressed on making public service prompt and effective for the economic prosperity of the SAARC region. He also accentuated on collective efforts for eradicating poverty, illiteracy, famine and backwardness from the region to maintain economic prosperity and good governance. PM Oli said that the SAARC needs more efforts to meet the peoples’ aspirations as it has completed three decades’ journey, adding that its support should be strengthened and increased. Prime Minister Oli stressed on investing more budget on infrastructure development and connectivity in communication sectors from the SAARC development fund. In another context PM Oli said that our constitution is the best one in the world as it has ensured the peoples’ rights and the provision of inclusiveness adding that it was issued with the consent of the people from the sovereign people elected body constituent assembly. It has institutionalized the republic system and will eradicate all kinds of discrimination, he argued. Similarly, Chief secretary Dr Somlal Subedi said that the public service sectors should be made prompt, effective and service oriented as people’s expectations were increasing in the sectors. He pointed out the need of mitigating corruption for economic prosperity and good governance. Likewise, SAARC secretary general Arjun Bahadur Thapa said that the SAARC has achieved notable success on eradicating poverty, regional development, prevailing peace and prosperity in the region during its three-decade journey. He informed that the upcoming SAARC summit will hold discussions on agriculture and infrastructure development. Chief Secretaries from its member state, high officials and monitors are attending the meeting. The meeting is scheduled to hold serious discussions on issues of reformation of governance system in the region identifying common problems and resolutions as well. This meeting has been taken with high priority for the SAARC summit to be organized in Pakistan.